New Chipotle CEO Brian Niccol is aggressively pushing to lead on innovation. It's injecting some welcome momentum into a company that's been lagging behind in recent years. Chipotle’s new CEO Brain Niccol pulled no punches when he sat down for his first earnings call in April and candidly described Chipotle as an invisible brand. “This brand needs to be leading culture, not reacting to it,” Niccol said at the time. In day-to-day operations, that’s led to a significant shift in the way that the company thinks about growth. Niccol said that he encourages more of a “test-and-see approach” on new initiatives under his watch, and in practice, the team has been freed up to move much more quickly on making decisions and testing new innovations. Niccol himself practices what he preaches — three months after he officially started as CEO, Niccol announced that Chipotle would be relocating its headquarters from Denver to southern California and closing down the New York City office. On the digital front, Chipotle’s chief digital officer, Curt Garner, has been in charge of translating Niccol’s directives into a number of new ideas on how to get quicker and more efficient on digital orders, a closely watched area of growth for the company. While Chipotle’s digital sales account for just 8.8 percent of total sales nationwide, it’s Chipotle’s fastest growing sector. Digital sales are up 20 percent year-over-year, and, more specifically, mobile sales are up 40 percent year-over-year. Chipotle is extremely proud of its second make line, the duplicate food assembly line made specifically for fulfilling takeout and delivery orders. The concept has been so successful for the chain that it’s currently installed at every restaurant that can manage to make room for it. The second make line itself is not new. Chipotle has been rolling out the concept for the past several years; however, Garner explained that the second line has been the perfect playground for recent technological upgrades to get orders out quicker and more accurately. In the second line’s first iteration — which is still in operation at the majority of Chipotle’s locations — customers place orders online or through the app and a printer spits out a paper ticket at that second line immediately, even if that food was ordered three hours in advance. It’s up to the employee to manually order the tickets so that food is made at the appropriate time, and to keep referencing the ticket in order to get the list of ingredients right in each order. Even though the DoorDash partnership has been successful, Garner says that Chipotle has no plans to go exclusive with the delivery service. “It is not our intention to be exclusive with anybody because we are about access,” Garner explained. “If somebody is on a different marketplace, we want to be able to provide them Chipotle as well.” Garner hinted at the possibility of more delivery partnerships to come in the near future. While the tech-enabled second make line has passed out of the testing phase and is rolling out on a large scale this year, there are other digital initiatives still very much in that test-and-see mode at Chipotle. The digital drive thru, currently in five locations across the U.S., is set up specifically so that customers who order online can drive by Chipotle and pick up preorders. It’s not a traditional drive thru: there’s no squawk box and it’s not set up to process in-person orders. Of course, there’s a few problems that could crop up there. Will customers who haven’t preordered hop into the drive thru lane, thinking it’s a regular drive thru? What happens if a car waits in line only to find that their order isn’t ready yet? If the pickup instructions aren’t crystal clear, are there traffic messes waiting to happen? Garner didn’t have specific answers to those questions yet. “We’re very much still in experiment and learn mode,” he said. “That’s why we haven’t announced any public plans on number of locations and where the next ones will be.” He did say that he had recently visited a restaurant with the digital drive thru along with Niccol and Chipotle’s chief financial officer, John Hartung, and initial results were encouraging. The majority of digital preorder customers were opting to pick up via the drive thru, and the percentage of the restaurant’s digital orders was much higher than Chipotle’s national average. 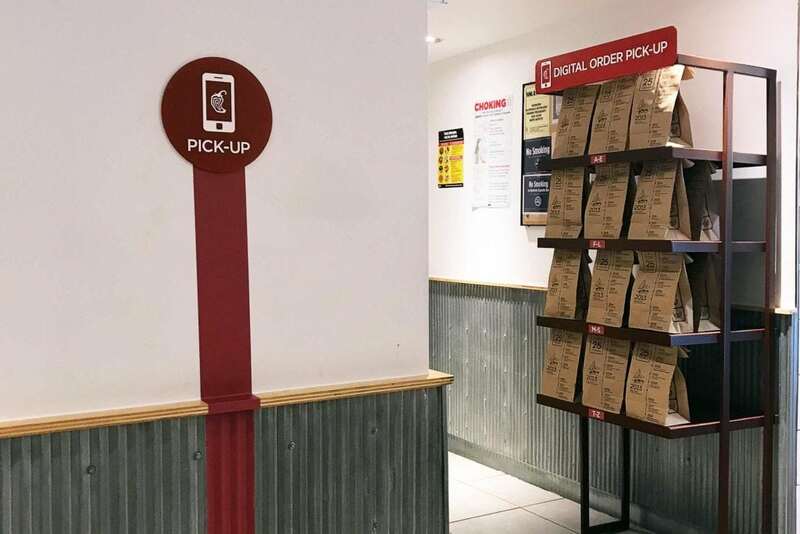 In New York City, Chipotle is testing out a mobile pickup shelf in five locations. Similar to Sweetgreen’s mobile pickup, digital preorders are funneled onto a shelf where customers can grab their order and go, circumventing the main line. Chipotle only asks for a name online and alphabetizes orders accordingly on the shelves. Again, potential issues could arise. Namely, what’s to stop a customer from swiping someone else’s order off the shelf, given that there’s no security around picking up preorders? Will customers know to follow the red line painted on the floor to lead them from the front door to the mobile pickup shelf, or will they mistakenly stand and wait in the main line for pickup? The mobile shelves just went live at the beginning of June, and the team will again be watching initial results. “We have a lot more to learn and a lot more tuning to do as we continue to experiment,” Garner said, crediting Niccol with allowing for that flexibility. There will be mistakes made along the way, mistakes that are more public in Niccol’s test-and-see approach. Skift Table tried out the mobile pickup shelf a few days after speaking with Garner, and it didn’t work. The food was accidentally held behind the counter instead of placed on the shelf and we had to wait in the main line to pick it up. But every experience, whether good or bad, is all part of this just-try-it edge that Niccol is championing. There’s no hard deadline on when or if each idea will expand to more markets. It took six months of testing in 25 restaurants before Chipotle decided to roll out the tech-enabled second make lines on a national scale. By contrast, the DoorDash integration got the green light after only a couple of weeks of testing. However, while Garner focuses on Chipotle’s digital future, it’s only one part of what it’s going to take to turn the business around. 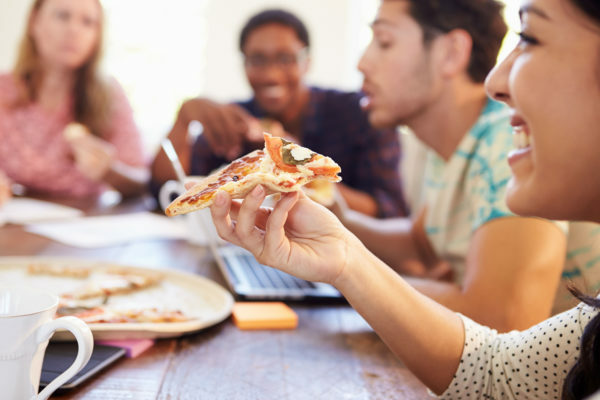 No matter how fast and how accurately the orders come out of the kitchen, the company has to focus on much-needed wins in menu innovation and marketing as well. Chipotle hit so many obstacles last year, from bad queso to yet another virus outbreak due to contaminated food, and while investors are warming up to Chipotle’s new approach, it’s going to take strong wins on all fronts to reposition the brand as a leader again.